The Whole Self Center’s philosophy suggests that every human being is more than a body with a brain. When caring for a child – a whole person - we are experiencing the creative spirit present in that child & in ourselves. As we remain interested in exploring creative possibilities for the individual in the moment, we are more open to experiencing something new, such as developing a valuable skill we never knew or thought was possible. In this way, we are less likely to stay stuck in repeating our old, inhibiting habits & behaviors. By living this understanding with individuals with autism, we continue to become better able to respect & support children for who they already are, deserving of love & attention simply for being. 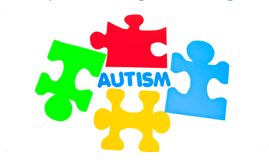 A well-rounded program… not only affirms the individuality of the person with autism, but also addresses the various ways autism is affecting a person’s daily life. Many professionals understand that no one autism program works for every individual. If the one full-proof program did exist, all educators and caregivers would use it for every child. Some programs are said to have been proven using evidence-based research, and therefore considered by professionals as the best and at times the only appropriate means to safely impact the growth and development of all people with autism. However, many professionals are interested in discovering what types of interventions and interactions work best for each individual based on the individual’s interests, abilities, and responses to attempts to engage them. Rather than fitting a person into one program, it is best to find programs that fit the person’s needs, learning mode and personality. It is not our intention to force families to adhere to specific autism programs. We will do our best to find Family Consultants and Intensive Individual Support Service Technicians who will follow the protocols that parents have already put in place for their child while also exploring new ways of reaching and teaching new skills and concepts. Parents and caregivers often rely on approaches that have worked in the past or that they feel will be the best option for their child. For example, some families believe that “Verbal Behavior” protocol is helping with speech and pragmatics. Over time, they may also conclude that other protocols facilitate learning of different functional skills. In this case, we look for support staff that can implement a Verbal Behavior protocol as well as provide functional skills development. Regardless of what program is developed for an individual, families and caregivers need to rely on each other to communicate, share accurate data, and track the person’s progress. The Whole Self Center makes documentation easy through its secure, on-line Whole Self Monitoring System. The WSC staff, Clinical Director, Supervisors, and administrators as well as the parent and caregivers can read an individual’s session notes and Treatment Plan progress on line on a daily basis. Maintaining a team approach helps everyone sustain the belief in possibilities for the person with autism, even if the person’s functioning and behavior in the past – and present – may lead us to believe otherwise. Our point of view is that can any of us know how far any person can develop unless we engage, encourage, and challenge the person and then support the person to meet those challenges to the degree their nature allows?